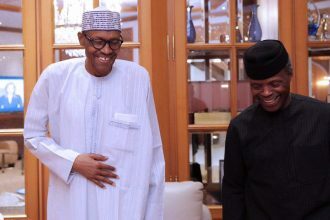 Nigeria’s Vice-President, Yemi Osinbajo on Thursday, said the decision by President Muhammadu Buhari to take only half of his salary was what made him (the Vice-President) to do same. Osinbajo said this at the public presentation of a book, “Making Steady, Sustainable Progress for Nigeria’s Peace and Prosperity” at the old Banquet Hall of the Presidential Villa, Abuja. Osinbajo said, “Some things have not been included in the book and I might just supply some of that. One of such things is the exemplary frugality, the honesty and humility, and sense of humour of Mr President. “That frugality can sometimes be a problem. As you know, Mr President decided that since government provides accommodation, food and transportation for the President and the Vice-President, we didn’t need a full salary. “Now, how much is this salary by the way? It is public knowledge and I think it is N1,750,000.00 or so, which is under N2 million. He said he would take only half of his salary and so I had no choice but also to take half of my own salary. “Unfortunately, Mr President turned down my request, to give the other half to a worthy cause – his Vice-President. He didn’t consider me a more worthy cause to give half of his salary! While describing corruption as Nigeria’s major problem, he added that the menace was the main reason for the depletion of the nation’s resources, such that the country had no savings when oil prices fell. Osinbajo said it was the prudence and honesty of the President that ensured that despite the economic downturn, the Federal Government was able to support the states, spend N1.3 trillion on capital expenditure, the largest in the history of the nation, and also ensure it met all our other obligations, both foreign and local. He added, “Mr. President’s unassuming personality and humility, is in my view, probably his greatest strength. This is why he is never flattered, or carried away by praise or adulation.